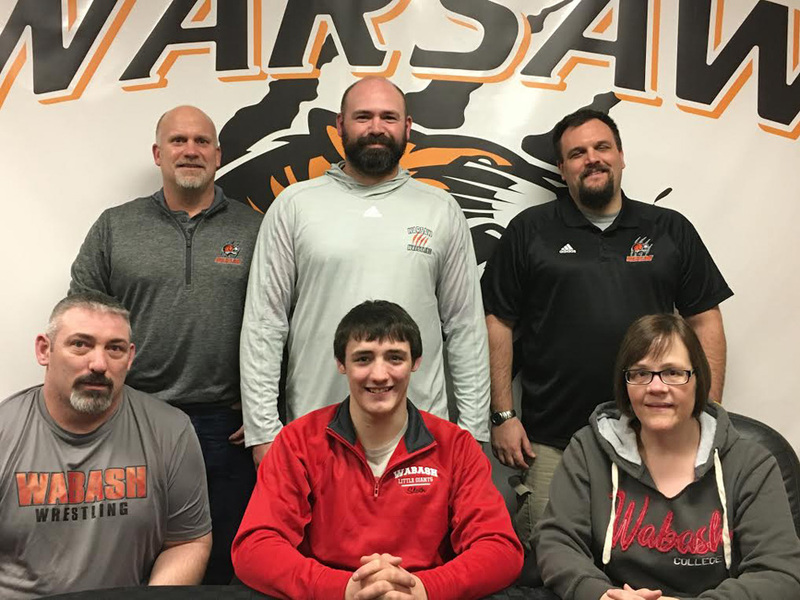 WARSAW – Warsaw Community High School senior wrestling standout Kyle Hatch has put together an impressive career on the mat, and the two-time state finalist has selected Wabash College to further his education and continue with wrestling. Hatch, who has compiled a remarkable 147-15 career record including a 69-1 mark over the past two seasons, stands 29-0 this year at 152-pounds. Hatch took 8th place at 106 pounds at the IHSAA state finals as a freshman (34-10 overall), and 7th at the IHSAA state 120-pound division (44-4) at the state meet as a sophomore. The senior standout currently holds the Warsaw mark for career pins, and he is closing in on etching his name in the record books for career takedowns. Entering this weekend’s first whistle at the Garrett Invitational, Hatch is just 25 takedowns shy of setting that standard. While pinning opponents on the mats, Hatch has had little trouble grappling tasks in the classroom as the gritty senior has earned a 10.37 grade point average (12-point scale) while enrolled in a number of honors, dual credit, or advanced-placement courses. The hard work on the mat and in the classroom earned the National Honor Society member IHSWCA Academic All-State First Team as a junior. A multi-sport athlete that lettered the past two seasons in football, Hatch understands the importance of representing his programs through service in the community, as evident through his efforts working with Feed My Starving Children fundraising and meal preparation for both his church and Tiger Football. Intending to major in math and computer science, Hatch will look to continue his wrestling career competing for coach Brian Anderson and the Little Giants. Wabash is a member of the North Coast Athletic Conference and NCAA Division III Athletics.